When it comes to using shiplap vs. drywall in the home, for us, shiplap always win out! The shiplap went up fast in the house, and we love the clean lines and look. When we built our home at the farm last year, we wanted to use natural materials whenever possible. So that meant choosing wood in place of drywall to cover walls, and in some cases, ceilings too. And shiplap was our go-to choice. In fact, there is not a single square inch of drywall anyplace in our home. Not on the walls, and not on the ceilings. And we wouldn’t have it any other way. For us, there is just something so classic, warming and beautiful about wood siding in the home. But above and beyond the beauty, there are some big advantages to choosing shiplap vs. drywall. With nothing more than a pneumatic nailer, a 4 foot level, and our four hands, Mary and I installed nearly of all the walls in our home and garage in just a few days. Drywall can leave a big mess during installation! When it comes to shiplap vs. drywall, shiplap wins big in the “less-mess” category. Drywall can make for one big mess in the home! All of that taping, mudding and sanding can leave a fine layer of dust that can seem impossible to clean. Shiplap on the other hand is complete once nailed up. No taping joints. And no mudding and sanding! We chose to leave our nail holes exposed for an authentic wood look. But even if you choose to fill the nail holes for a completely smooth finish, the sanding is limited to small areas. Although you can sand and finish drywall with special equipment to cut down on the mess, it will certainly add to your budget. 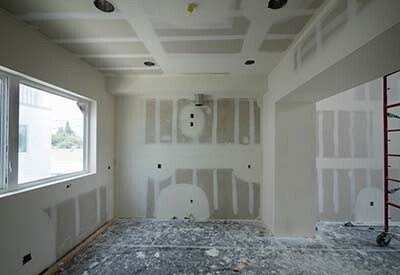 Although a 4 x 8 sheet of drywall can seem inexpensive, it can actually get quite costly when it comes to taping, mudding, sanding, priming and painting. The average cost of installed drywall can run somewhere between $1.50 to $1.80 per square foot. It can go up considerably from there if the job goes beyond traditional straight wall and flat ceilings. 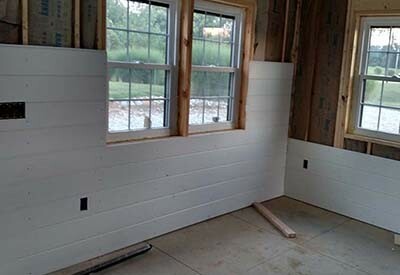 Shiplap installs easily, on stud walls or over existing drywall. We purchased our shiplap from a local sawmill and were able to install it ourselves for well under a $1 per square foot. 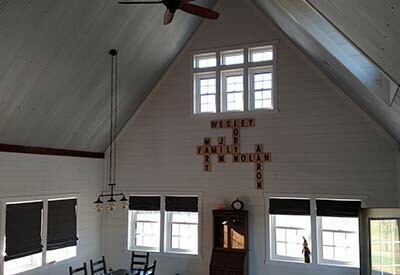 When you add in that it included the shiplap being painted – it was a huge savings to our budget! With shiplap, there is no more looking for studs to hang pictures. With 3/4 of wood throughout, every space on the wall becomes strong enough to hold a nail for pictures and wall hangings. I have to admit that this feature of shiplap is one of my favorites! Finally, when it comes to shiplap vs. drywall, the durability of shiplap simply can’t be matched. We have all been there at some point in our life. We are moving furniture, or something slips or gets thrown. The next thing you know, there is hole or a large dent in the drywall! Out comes the patch – and the taping, sanding and painting start all over again. That is simply not the case with shiplap. With a make up of 3/4″ of solid wood – it can take a beating without cracking or breaking. And if it does happen to dent, it just adds a little character to the wood. It’s hard to pull of the character angle with a hole in drywall! Here’s to using a little shiplap in your home! Jim and Mary. To receive our 3 Home, Garden, Recipe and Simple Life articles each week, sign up for our free email list. You can also follow us on Facebook, Twitter, Pinterest, or Instagram. This article may contain affiliate links. ← 5 Simple Pre-Winter Home Tasks That Can Save Money and Headaches! How easy is it to replace damaged boards (mold, water, fire, and cracked or otherwise damaged during its lifetime) vs. cutting out a square of drywall and taping? How does hold up for fire protection compared to drywall? Is this what you use one the ceiling as well?